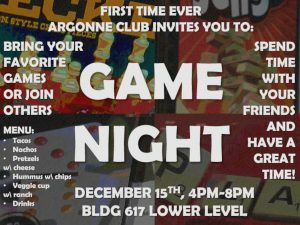 The Argonne Club will host a game night on Thursday, Dec. 15, 2016, at the Bldg. 617 Lower Level from 4 to 8 p.m. Employees can bring their favorite board games or join in with others. Posted in Announcement	| Comments Off on Join us for Game Night! 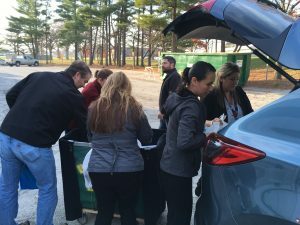 The Argonne Club wishes to thank Argonne Veterans and the Argonne community for generously supporting the 2016 Support the Troops Collection Drive. The donations were delivered to the Lemont Veterans of Foreign Wars Post #5189 and gratefully received by the Ladies Auxiliary Division. Breakfast with Santa 2016 tickets will be sold in the Cafe Bistro (Bldg. 213) November 14-18 from 11:45-12:30 each day. Plan to attend the 2016 Halloween Party at the Exchange Club (Lower Level Bldg. 617)! Please note there is a $2 cover charge for this event. 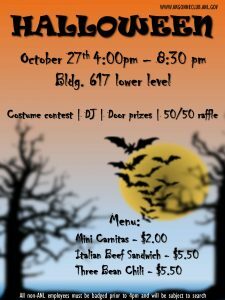 Posted in Announcement	| Comments Off on Plan to attend the 2016 Halloween Party at the Exchange Club (Lower Level Bldg. 617)! 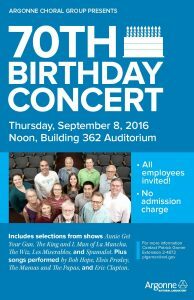 Argonne Choral Group – 70th Birthday Concert! Posted in Announcement	| Comments Off on Argonne Choral Group – 70th Birthday Concert! Feliz Cinco de Mayo 2016! 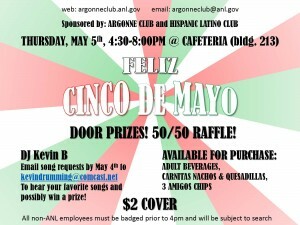 Posted in Announcement	| Comments Off on Feliz Cinco de Mayo 2016! 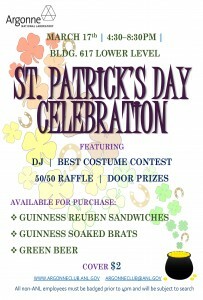 St. Patrick’s Day Celebration on March 17th! See you at the Exchange Club! Posted in Announcement	| Comments Off on St. Patrick’s Day Celebration on March 17th! See you at the Exchange Club!